Wanted to share some ways that I use technology as a school-based SLP! Say it with me… Technology is your friend. Now, I do agree that it is REALLY frustrating when it doesn’t work. You make your plan, get your lesson prepared, go to grab your computer or tablet, and something goes wrong! True. But don’t we also have to always be flexible and have back up plans for our lessons even when technology is NOT involved? It’s part of the gig! 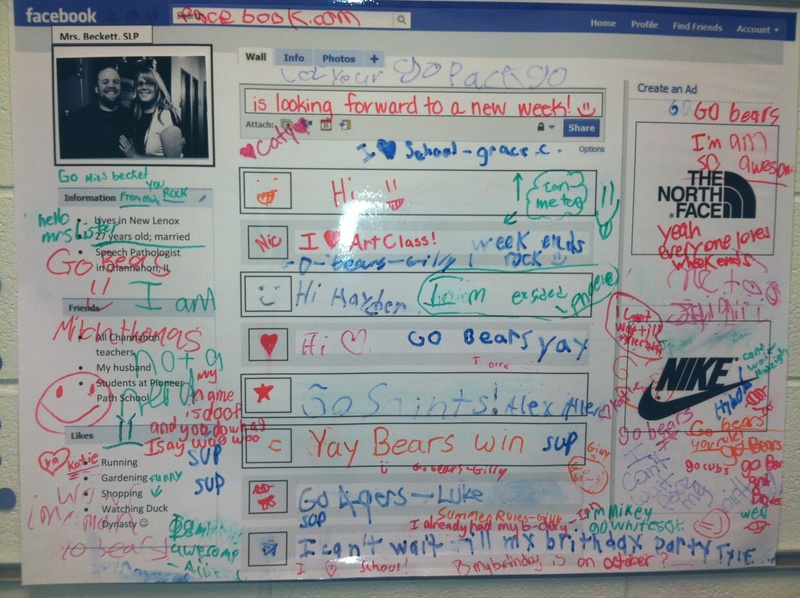 Technology can really help to supplement your lesson, relate to your students, and motivate kids to learn. Here are some basic ways that I’ve incorporated technology into my job…. So excited to be starting my 7th year in speech pathology in Channahon. I love our students and seeing how excited they are to be coming back to school. I have lots of new ideas and resources that I’m looking forward to using this year as well. I think we as teachers and therapists have to be EXTRA excited at the start of the school year in order to get our students thinking positively and wanting to learn. I hear many parents and teachers that are dreading the start of the school year… why?! I am the first to say that summer was so fun and I loved being home with my little man, Carson. I mean… stroller walks, playing in the pool and nonstop peek-a-boo never gets old, right?? 🙂 But I also really appreciate each season for what it brings. If it was summer all year round, we’d never look forward to it as much as we do now. We’re always wishing we had something in the past or looking forward in the future. Today is a GREAT day! Thankful for each and every day I can get up and work with my students and try to help spread a positive and hopeful mindset. Some of our students are extra excited about the school year because they may have less-than-wonderful circumstances at home. Maybe a death in the family, a financial hardship in their household, a best friend moving away, or parents getting divorced… Sometimes coming to school is the only safe haven our students feel—a place they feel safe, loved and accepted. So put aside the regret of a never-ending summer and look forward to TODAY, not only for you, but for each and every face that walks into school this week. They need us! What are YOU most thankful for this school year? These are great—I use them often. I have a big population of kiddos that do not necessary fall under “Autism” or “Asperger’s,” but definitely have some difficulty with social skills and social language. These are also a great option to use with our school social worker in a co-treat session. These can be matched (question with answers), read aloud the question without the visual, OR sometimes I let the kiddos take turns picking someone in the group to ask. These fun decks are so convenient and relevant to our IEP goals. Highly recommended!! Parents could definitely use these at home to help reinforce social language skills! Super Duper Handouts—these are great! I have used these a TON. I print them to send home to you as parents, and give them to other therapists and teachers. There are some that are related to things to do with your child over summer. Great resources in here too for other SLPs that give you background on how to refer a student, what RtI is, what therapy looks like, what certain disabilities look like, etc. Many of these are also available in Spanish. Here are some that I have found and used…. What are some of YOUR favorites?! Can I revise an IEP once I sign it? Jill Kuzma is a GREAT speaker that I was able to see…she talks mostly about pragmatics, social thinking, therapy for kiddos with Autism, whole body listening and (my fav) SuperFlex. Follow her blog AND follow her on Pinterest for even more therapy ideas!! My new project for this year is my Facebook wall. The kids LOVE it! I made a version of one I found online and just changed the information. Then I found a picture, laminated it, and just used sticky tack to put it on my wall. That way—I can change it easily throughout the year. 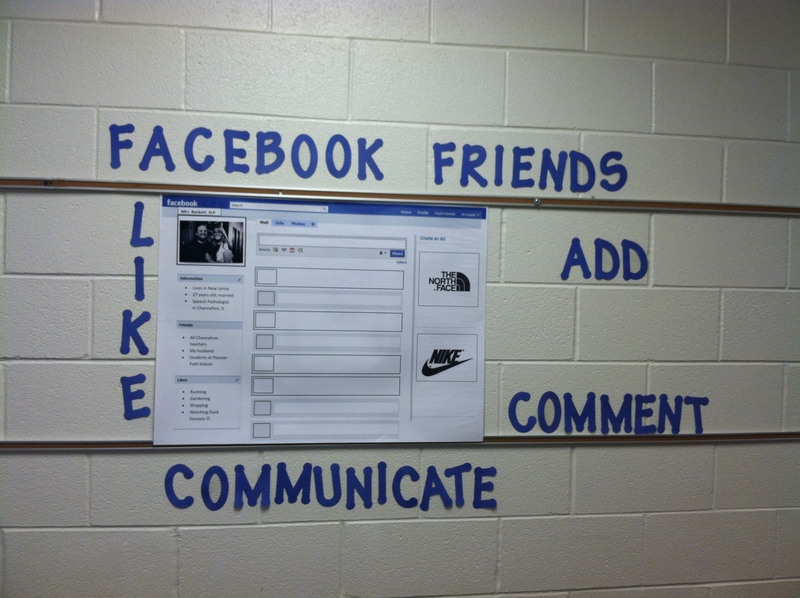 I added some Facebook “vocab” around it to incorporate, as well. The kids then made their own mini FB profiles and I laminated and hung them all up next to mine!